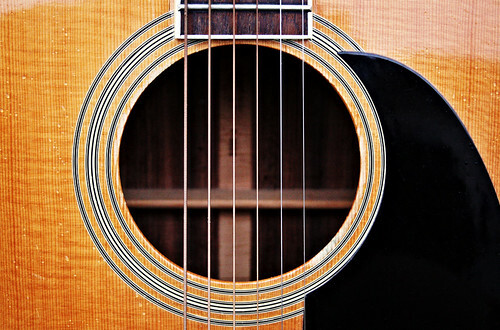 The guitar shows the wear of years of hard playing, careless maintenance, and incredible moments of music. It's been played for babies: preborn, newborn, and toddling. It's been strummed at weddings (including my own), funerals, anniversaries, concerts, plays, assemblies, recording sessions, retreats, youth camps, prisons, juvenile shelters, classrooms, Gospel missions, street corners, homes of friends, front porches, backyards, and in the backseat of a Toyota on I-5. It's been strummed, picked, slobbered on, spat upon, knocked over, spilled on, climbed on, dropped, scratched, cracked, dented, detuned, and used as an instrument of celebration and love. The Daily Shoot challenge today asks for an exploration of negative space. It made me think of the lines between the strings and the depth of the sound hole, the aperture into the rosewood and spruce body. I'm not thrilled about referring to it as negative space, however. This guitar is a positive space. A six-stringed friend of twenty-three years. Today's Daily Shoot assignment: Negative space can be just as important to a composition as your primary subject. Explore negative space in a photograph.